We have a new alpaca on the ranch! On Wednesday, June 8th, Tulip gave birth to her second cria (baby), the adorable little Tripoli. The birth went well, although his first hours of life were a bit of a struggle, and not just because he’s our first baby ever (unless you count me and my brother 😛 ). Tripoli takes a break from being born, which is hard work! I’m paraphrasing my mom who was paraphrasing the vet, but it goes something like this: the stress of being born made his brain swell, which made him a touch daft for the first day of his life. I guess (I was out-of-town, darn it) he tried to nurse just about everything in the paddock, from fences to feeders, except for his mom, of course. So Mom and Dad had to run out for baby bottles and goat milk, which sustained him until his brain got un-fried. He’s nursing and gaining weight now! Phew. Thank goodness that’s over! One healthy cria successfully born, one to go! Trip is Tulip’s second baby. The great, white Tuscany was her first. Tuscany is not the sharpest tool in the shed, and he can’t blame it on brain swelling like Trip can. 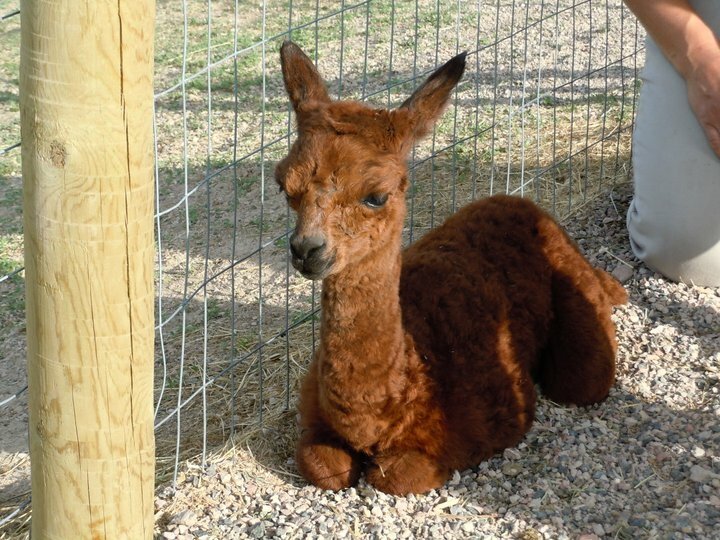 This entry was posted in animals and tagged alpacas, crias. Bookmark the permalink. Should be working but I couldn’t resist. Alpacas are adorable, can’t wait to see them sometime. They are adorable. We should have a new baby to see soon! They are the cutest little spazoids.